How are iron and copper released by bentonite clay while chromium and manganese are targeted and swept away? Dr. Axe doesn’t sufficiently explain this, but accidentally delves into antimatter and magic in his attempt (see text). Golly gee! I want to know more! Wait. Hold on. Does the clay draw elements out of the body, or put them in? Why limit the levels of these elements, Dr. Axe? 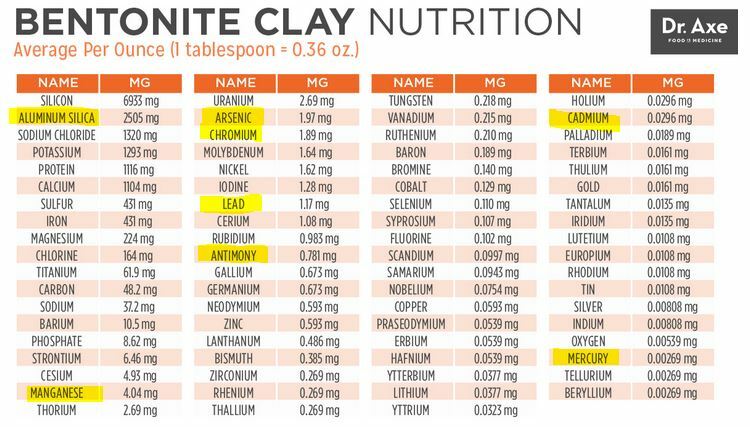 But… but… all of these “heavy metals”, according to you, Dr. Axe, are found in the clay you’re pushing. But do go on… what kind of “big effects” can consumers of your super soil expect to experience as the toxins accumulate in their bodies over time? Of course, you could still buy into Axe’s contradictory argument that bentonite clay hunts down and removes these metals from the body. The problem is, he can’t explain how the good metals are dropped off at the physiological bus stop while the bad ones are picked up by the heavy metal police and carted off to jail without ever passing go. He makes a hilarious attempt, referencing “positively charged electrons” (that’s antimatter! ), but in the end it boils down to magic. So that I’m not accused of quote mining, I invite you to read his entire article. 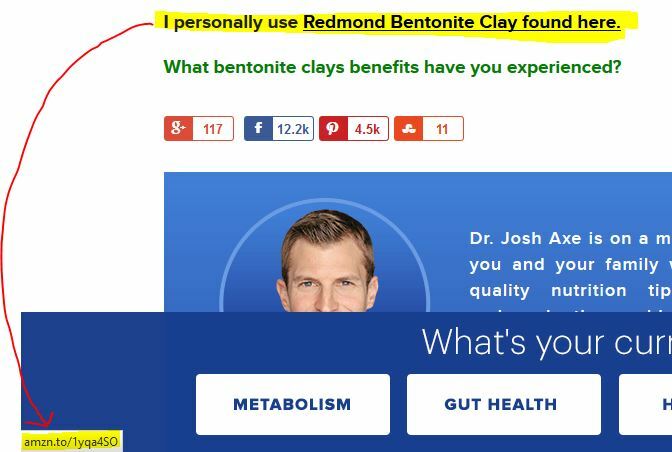 Not only does Axe recommend bentonite, he earns money when you buy it. In the above image, I’ve highlighted the hidden, encoded Amazon.com affiliate link. 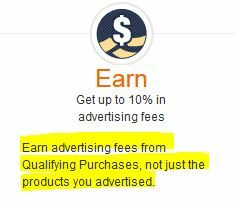 When you’re redirected to Amazon to snag this product, not only does Josh Axe get a cut of the purchase price, he’s also set up to earn commissions on anything else you happen to buy during your shopping session.4,5 Amazon pays out because they’re grateful to Axe for directing you to their web site. The problem is, legally, the good doctor is supposed to clearly disclose his affiliation when he sends you off to buy–but he never does. Axe simultaneously claims bentonite clay both sweeps elements out of your system and puts them in. Which is it? No scientific explanation is given for the above contradiction. Axe ascribes near-magical abilities to bentonite, allowing it to hunt down toxins with “positively charged electrons” (antimatter? WTF?) after coming into contact with water. Harry Potter would be proud. The so-called doctor’s mastery of chemistry is so poor he can’t differentiate between elements and minerals. The “no safe level of chemical to ingest” mantra could not be more clear in Axe’s writing, yet he proudly lists the levels of each proclaimed toxic chemical in bentonite clay. Does he ever read his own words and labels? 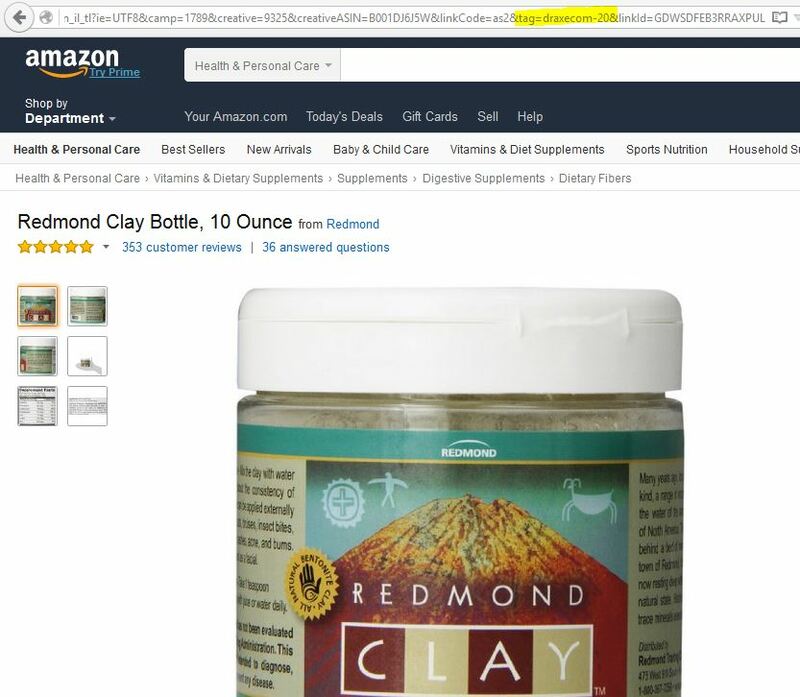 Josh Axe, Redmond Clay, and Amazon.com website screen snapshots are used in strict compliance with Title 17 U.S.C. Section 107 of United States copyright law (commonly known as “fair use law”). This material is distributed without profit with the intent to provide commentary, review, education, parody, and increase public health knowledge. Snippet of the periodic table of the elements taken from ptable.com and also used under Title 17 U.S.C. Section 107 of United States copyright law (commonly known as “fair use law”) with the intent of providing education. Happy faces poorly drawn by the author. (3) Is Your Lipstick Toxic? This entry was posted in Alternative Medicines, Health, Medicine, Skepticism and tagged aluminum, bentonite clay, debunked, dr axe, health, lead, mercury, toxins by Mark Aaron Alsip. Bookmark the permalink. Axe is a businessman and nothing else. All his words of wisdom when it comes to natural cures are all plagarised. I have read his book eat dirt and he has not presented much scientific evidence to backuo his claims. He is simply there to sell you his products by painting a false scary story. I have taken his recommedations and ended up with more problems. Axe is a snake oil ssalesman. I just discovered that Josh Axe was becoming famous. I went to Chiropractic school with this guy. The impression I got from him as a student was that he was a guy who wanted to be able to refer to himself as a “doctor” or “physician” and didn’t have the grades to get into med school. I just want to clarify that, wherever he came up with all of this crap, it was not, in any way, part of the chiropractic curriculum. It is people like this (and they are becoming more and more common as chiropractors have to find ways to supplement their paltry income) who have ruined the chiropractic profession. It is no wonder health insurance companies don’t compensate us appropriately. As a side note: It was drilled into us in school that we would lose our chiropractic license if we in any way attempted to misrepresent ourselves as medical doctors. In fact, it was mandatory that we attend a state board hearing. In the one I attended, the offending chiropractor simply referred to himself as Doctor Whatever-his-name-was on a billboard and had his license revoked. Maybe, once you have enough money, this rule no longer applies? In addition to the professional repercussions, how has he not been charged with criminal fraud? I’m not American, but I just looked up US law on the subject. His statements could, from my layperson reading(though with a fair deal of experience from a career with the courts), fall under the broad category of Fraud and False statements, more specifically under the section covering false information and hoaxes. Further, he recommends consumption of various alternative cures that can clearly cause serious physical harm. Why does he not realize or care how serious his conduct is, and why is nothing being done to stop him? This has been tested and found to be crap. Anything to add on this Mark Twain? It seems you are completely wrong? These dummies know nothing of health and wellness! I’m sure they think the pharmaceutical science they believe in, is valuable, regardless of how many sick and unhealthy Americans there are from such beliefs! Bentonite, or the clays are even sought out in nature, by various animals, for various ailments. It’s a shame that someone has given them the knowledge of health and life, then they come on the internet like they actually know something, and slander him! Sad! Animals have been given knowledge to seek out the chemicals in Bentonite for health benefits, yet they’re not smart enough to avoid crossing the road in front of cars, electrocuting themselves while wire-hopping on the power grid, or flying head-on into plate glass windows? Seriously? I was willing to read your entire article and even your responses to comments to give you the benefit of the doubt but your ignorance truly has shown itself. Animals operate on intuition and information embedded in their DNA. This is how they know how to procreate, find mates, feed, hunt, etc. Dogs eat grass as an emetic. Monarch butterflies know their journey thanks to their innate wisdom. Modern conveyances, “human” machines, etc. are not part of their body’s innate wisdom. Native peoples from all over the world learned much of what they know to be healing (or poisonous) compounds in nature from observing animals. Many of these ancient remedies are still used today and many are resurfacing as viable treatment modalities today, even in mainstream medicine. Saw palmetto is the primary ingredient in the pharmaceuticals used to treat prostrate cancer. Little do people know that men can prevent prostrate issues by taking a saw palmetto supplement. Anyway, animals are obviously smarter than humans when it comes to healing themselves. How many wildlife do you hear about with diabetes? Yet domestics are suffering the same human issues, thanks to human intervention. Turn on a nature show like Planet Earth, and educate yourself. Thanks for the reply. You didn’t answer my questions. Please do; I am answering yours. If dogs are so have this built-in wisdom you speak of, why haven’t they figured out it’s dangerous to run in front of cars? If animals are so wise in finding cures for themselves, why haven’t rats, most whose DNA predisposes them toward cancer, figured out a cure? So a quack chiropractor is now a Dr ? Now the garbage really starts. …. they grab a devices which is no more than a glorified pen that clicks … they touch the leg they feel needs adjustment and instantly the 1/4” disappears…. This dope is going hurt people. With this crap …. Genetics and yes, Eating well ,A healthy active lifestyle …from childhood Makes all the difference … I’m not a gambling person , I bet axe is phony as well . just like that unhealthy weird looking snake oil salesman. Jkelly, I would hope that you would not judge the entirety of chiropractic as quackery based on people like Josh. Though, unfortunately, most of the profession has gone in that direction. You can, however, find practitioners who actually paid attention in class and practice actual chiropractic. For example, if the chiropractor you went to knew what he was doing, he would have told you that one of your legs only appeared longer when you were laying prone because of a (potential) misalignment of your pelvis – it is probably not actually longer and he certainly didn’t shrink it or grow the other one. More often that not, however, pelvic misalignments are more the result of a muscular imbalance than an actual problem with the bony structure. In which case, you’re better off with a massage therapist or physical therapist than a chiropractor. Also, if said chiropractor knew what he was doing, he would know that the force required to correct a true pelvic misalignment is far, far greater than that elicited by an activator (the stupid bic-pen-looking instrument). Actually adjusting the spine is hard to learn and takes years of practice to master. Those who can’t figure it out (or just aren’t physically big or strong enough) use activators or other clicky things and rely on placebo effect to convince people they’re doing something worthwhile. In short, Chiropractic has quacks that don’t practice based on any kind of real science. However, the same can be said of some Medical Doctors. I will grant you that Chiropractic, with its decreased admission requirements to get into its colleges, attracts a much higher percentage of those types of people. Many others are forced into quasi unethical practices to make ends meet because an honest chiropractor is a poor chiropractor – That’s why I retired from the profession. But Chiropractors are “doctors”. You can’t get into the program without a bachelor’s degree. Then it’s 4 more years or the equivalent (the college I went to was 3 years with no summer breaks) to get a doctorate. But we are Doctors of Chiropractic, not medical doctors. And to portray oneself otherwise is unethical. We aren’t taught a single thing about medications. Well… I was because I took pharmacology as an elective while obtaining my bachelor’s degree – but hardly enough to give a professional opinion on the matter. – If they use any instrument to adjust, they’re not good – Chiropractic literally means performed by hand. – If they drive a car less than 5 years old they’re making far too much money for a chiropractor. – If they are treating hundreds of people per week and always have a full waiting room they are probably great salesmen because they are likely convincing their patients that they need a lot more treatments than they actually do. – If they set up a treatment plan that goes out months, they are just taking your money and hoping the body will heal itself so they can take credit for it. And I just realized I spent way too long typing up something that almost nobody will ever read. Best of luck to you though. Have you considered all the the detrimental consequences that have taken place when we take the advice of these trained professionals called “Doctors of Medicine”? All pharmaceuticals are poisons and deplete your nutrients as does consuming sugar. They never rid your body of it’s problem without creating another problem. People like Dr. Josh Axe, can certainly stand corrected when it comes to the science they study. Doctors of Medicine will be the first ones to admit they know almost nothing about nutrition. They can only help you with your symptoms when the problem is already visible. My mother has trusted “Doctors” for years. They have her on 11 different medications. She now suffers from medically induced lupus. Her physician admits it is a reaction to a prescribed drug. Now according to “medical science” that is currently impossible to reverse. Was it wise to take the advice of this “Doctor” or was he or she a quack? I’m very sorry about your mother, Christa. We all know that no medical treatment is without risks. Every doctor I have talked to has stressed that fact. Nothing I can say will minimize the pain your mother, you, and your family are facing, and I am truly sorry. My own mother was diagnosed with Chronic Myeloid Leukemia (CML) over a decade ago. It was a death sentence. Doctors started her on a new drug, Gleevec. As time went on, the medical establishment you speak of learned something incredible about Gleevec. While stopping short of the word “cure,” the overwhelming majority of patients who went on the drug and should have statistically been dead within a few years (almost NOBODY survived CML more than a few years) were living AND SHOWED NO SIGNS OF THE DISEASE. My mother is in this group. She shouldn’t be here, but she is. Because of modern medicine. Are there risks? Yes. Are they worth it? With all respect and honest sympathy to those who suffer from the advertised side effects (this includes my own mother), I would say yes. I take issue with your claim that doctors don’t know anything about nutrition. My own doctors are very knowledgeable, and I interview doctors often for my articles and they are well informed. What you didn’t say, but I pick up on quite often in debunking, is an unfounded belief that nutrition alone can cure all diseases. Speaking with the knowledge gained from all the physicians I’ve interviewed, I assure you that is not the case. Thank you for reading and commenting. Again, my deepest sympathies to your family for your mother’s condition and I will keep her in my thoughts.